Mikey Fuller | Interiors: Heart to Heart 2011 Sneak Peak! Heart to Heart 2011 Sneak Peak! I'm joining Sarah over at Makin' Projiks in her 2011 Heart to Heart Valentine's Day swap. I and 14 others are creating hand made Valentines! I've already spent most of my free time this week working on it! This is so much fun! Here are some photos of my progress....I'll be sure to post on all the ones I get closer to Valentine's Day! 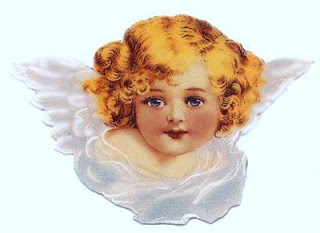 I cut hearts out of antique Scribners' Magazine pages--thanks Wanda (www.wandabond.com) for all the Scribner's pages! 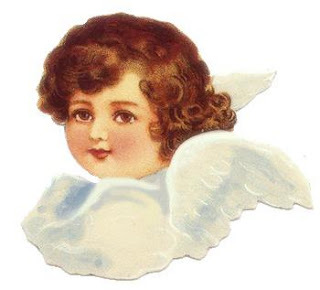 I downloaded the vintage cherub image somewhere online (I have no idea where...) from a copyright free click art source--if you know where I got this, I'd love to share it with everyone! The lace is vintage--it is from an 1950's era prom dress....I got this and lots of other vintage ribbons and fabrics at an estate sale about two years ago....I'm still finding cleaver ways to use all the neat things I got there. For best results printing this--use a laser printer--copy the file to an empty Word document and adjust all the margins to zero. Copy the above image and size it so you can fit 15 per page.